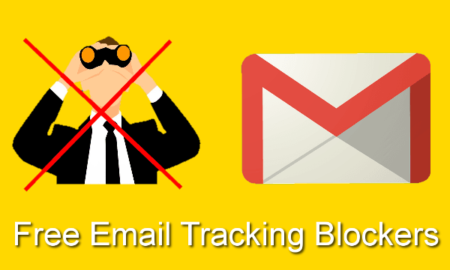 Here are 4 free email tracking blocker for Gmail to block email read receipts. Here I will list some Chrome extensions that prevent trackers from knowing that you have read or opened the email. 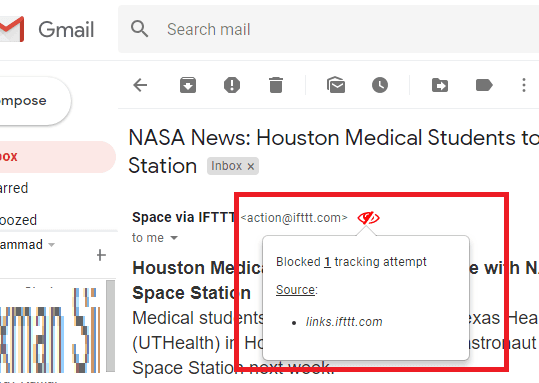 Not only blocking the tracking emails but some of these extensions can also show if the emails that you have received have trackers enabled in them. And then they can intelligently block them. There is nothing you have to configure in these; you just have to install them and forget. They will keep blocking the trackers until they are installed in your browser. Emails that you receive everyday from shopping sites or from any other senders, they usually have trackers embedded in them. Also, there may be the tracking links in them. So what happens is when you open an email or click on any link, the sender will be notified about that. I have already covered some services for unlimited Gmail tracking but now I will tell how to block that in this post. If you don’t want the email senders to know that you have opened their email, then you can use any extension from this list. And not just Google Chrome, but some of these extensions work in other browsers like Firefox and Opera too. These simple extensions are free to use and there is not even an account required. Just install them and keep trackers away from you for as long as you want. Ugly Email is a powerful Chrome extension that blocks the read receipts for Gmail. It also works with Firefox and blocks all the trackers which are embedded in the received emails. It adds an “eye” icon to each email to indicate that email contains a tracker. By default, it blocks the tracking code or link inside the emails while it is installed in your browser. There is nothing typical you have to do to make it work. Just install it and then it automatically does its work. You can install it in Firefox or Google Chrome using the above link. After that, refresh the Gmail if it was open previously. You will see that it will add an “eye” icon in front of all the mails which contain trackers. And it automatically blocks all of them. The senders will never know if you opened their emails or click any link from the mail body. Read full review of Ugly Email here. 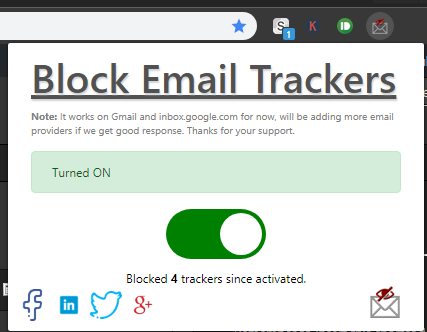 PixelBlock is a very simple Chrome extension that helps you block trackers in Gmail. It helps you in getting back your email privacy by working in a very straightforward way. Though it doesn’t indicate the emails with trackers from the Inbox but it shows the tracking icon in the actual email body. When you open an email which has a tracker in it then it will show you that on the top of the email body. And the trackers are disabled by default when you install it. This extension is only available for Chrome and you can install it from Chrome Store using above URL. Also, there is nothing you have to configure. Just install it and it will automatically refresh the tab in which Gmail is active. After that, you can open any email and see its icon. Its icon will appear if there is a tracker in the email that you have opened. It also shows the source of the email in a popup when you click on the “eye” icon. 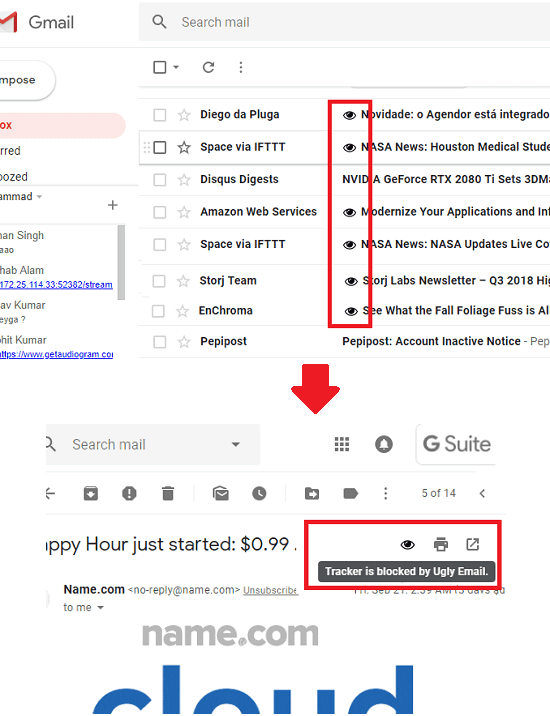 Block Email Trackers is another free extension for Google Chrome that you can use to block the read receipts in a tracked email. Currently it supports Gmail and Inbox to prevent the receipts reaching the tracker. You can install it and then it will keep doing its work. It doesn’t add its icon or any other tracking indicator in the email body, but you can see from its toolbar icon how many trackers are present in the currently opened email. Just get it from Chrome Store using the above URL and then refresh the page in which Gmail is open. After that, it will start doing its work. As you receive an email which has a tracker in it then it will identify that and block it. The sender will never know when it was opened. All the works it does in Chrome is totally offline. There is no server involved while it is blocking the read receipts in Gmail. 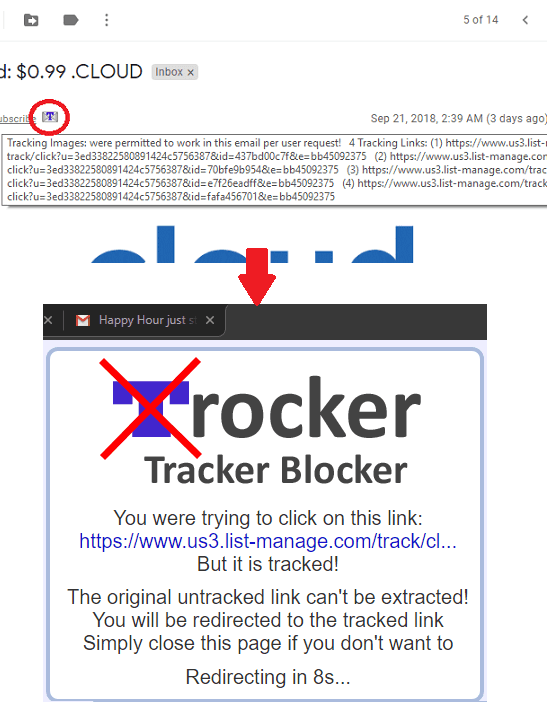 Trocker is yet another free Chrome extension that allows you to block trackers in your emails. Here it works with Gmail and available only for Chrome. It works in a very simple way by blocking the tracking URLs and images in an email. It adds its icon in the email and when you hover over that, it will show you the tracking URLs in a popup. Also, when you hover on any tracking link or an image, the cursor will change, indicating that the element is tracked. If you click on such image or link, then the sender will be notified. Also, when you accidentally click on a tracked URL then it will show you the popup in browser. Just install this extension using the above link and then you can let it run in the background. When you open an email which has trackers in it then you will see the count of the tracked URLs on its icon. Also, if you hover over its icon in the email body then you will see the URLs and images which are being tracked. And when you click on a tracked URL then it will show you warning popup as I have shown in the above screenshot. These are the best free email tracking blockers that you can use to prevent tracking in Gmail. These are very simple Chrome extensions and you don’t have to care about the configuration part because there is none. Just install them and forget. All these tools block the trackers by default and get you back your email privacy for free. So, if you are looking for ways to block email tracking then this post may be helpful.